"On Washington's birthday in 1893 a great blizzard raged in New York. I stood on a corner near 5th Avenue, watching the lumbering stagecoaches appear through the blinding snow and move northward on the avenue. The question formed itself: Could what I was experiencing, seeing, be put down on the slow plates and lenses available? The light was dim, [but] knowing that where there is light, one could photograph, I decided to make an exposure - I saw the stagecoach come struggling up the street with the driver lashing his horses onward. At that point, I was nearly out of my head, but I got the exposure I wanted." In my previous review of the documentary, Jackson Pollock, I discussed how the advent of the camera left the artist emasculated, robbed of his purpose and livelihood. It sounds brutal, but it was exactly this event that led the artist to uncover his own vision of the world around him: the defining thrust toward modernism. It didn't take long (historically speaking) for artists to make this leap; but it has taken the public the course of a century to comprehend, accept, and finally welcome the "new art." For the photographers that instigated the change, it is still, even today, a difficult road. In the first years of 20th century, Kodak had already developed a camera for the masses, with the slogan "You press the button�We do the rest." If anyone could snap a picture, how could this medium ever be "art?" And this translates into the struggle of digital artists today, who not only have "machines to do their work," but software to "assist" them. The answer is that whatever tool one chooses to wield�a brush coated with emulsified pigment, a mallet and chisel, a stylus and copperplate, a digital tablet or a box of mirrors and lenses�it takes an artist to make art. Define that as you wish. What Alfred Stieglitz did for photography�and artistic modernity�was to translate a new vision of the world through the lenses of his "black box." This documentary begins with one of the most important photographs recorded in the history of art (the 1893 exposure described in the top quote), and takes us through the impossibly swift and radical changes in American culture that began with the turn of the century and continue to impact it now, at the turn of the 21st century. This man, a visionary, not only dedicated his life to the fight for photography-as-art, but brought Modernism in art to the new world. He introduced the controversial drawings of the sculptor Rodin to the American public. He gave Picasso his first solo exhibition�anywhere in the world�at his New York Gallery in 1911 (two years before the notorious Armory Show). He also mentored the first American Moderns: photographers Edward Steichen, Clarence White and Gertrude Kasebier; later, Paul Strand, Ansel Adams and Eliot Porter, as well as the painters Arthur Dove, John Marin, Marsden Hartley and Georgia O'Keeffe. But it was stunning to Stieglitz to realize that the new age he evangelized and heralded led to its own inevitable fate: the Cubists, the Precisionists and, eventually, the wildly commercial abstract-expressionist and pop art movements�the latter of which, enviably, he did not live to see. Stieglitz was uncompromising and relentless, both to his glory and detriment; in the end, he found himself in a losing battle against the juggernaut of Modern Art that he considered "vulgar." Alfred Stieglitz: The Eloquent Eye is a richly researched, visual essay that turns an objective lens back on its subject and depicts this influential geomancer of American Modernism in the natural light of his era, with the distance and perspective of time. Image Transfer Review: As with most documentaries, the wide variety of source material comes in a spectrum of conditions, especially with supplementary stills and film footage of this age. The transfer itself is excellent, especially noticeable in the displays of Georgia O'Keeffe's flat, colorful paintings and the stunning contrast of the black & white photography: if Stieglitz saw the pores on Waldo Frank's face, we see them. The brief 1964 interview footage with Edward Steichen is a treasure, as are the clips derived from director Perry Miller Adato's 1980 interview with O'Keeffe, and will hopefully be restored on their own someday. I am pleased to say that it seems Fox Lorber maintains a fine standard of quality for the American Masters series I have reviewed. Audio Transfer Review: The audio transfer is also respectable. There is nothing dynamic expected from a biographical documentary, and there is nothing for which to fault this DD mono track. Extras Review: Fox Lorber has designed this menu around the cover art and it has a very finished look, the best I have seen from them to date. No bells and whistles, but a very clean design. They provide a moderately comprehensive biographic timeline in 10 screens (there's a Flash version available on pbs.org that's a bit more interesting), as well as DVD production credits and their usual (Mac-mean) weblinks that PC users can access via their DVD-ROM drives. I noted the on PBS' own website they have quite a bit more information about this program, including a brief essay and a transcripted excerpt from an interview with director Adato, as well as additional video footage that did not make it into the final feature of the various interviewees. One has to wonder why these supplemental tidbits could not have been included on disc. PBS and its American Masters series presents a spectacularly in-depth examination of a true American master whose complex nature galvanized�and eventually, polarized�the avant-garde of American Modernism. 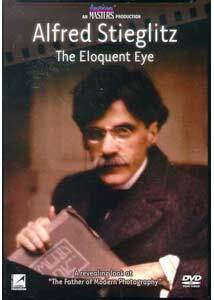 Highly recommended for anyone interested in 20th century art, photography and culture, Alfred Stieglitz: The Eloquent Eye also serves as an impressive visual history of the first half of the last century.